Tutoring 101: How to make tutoring more efficient? This guide will help you make tutoring more efficient. How to prepare for the first meeting with your tutor. What is the role of the parent with respect to tutoring? Frequency, duration, and number of hours of tutoring: is there a magical formula? Are you a client at School Success? Would you like to learn more about our tutoring services? A representative will contact you and offer you a $25 discount on our services. Your child needs help in math? A certified tutor can help you! Becoming a math wiz is possible! 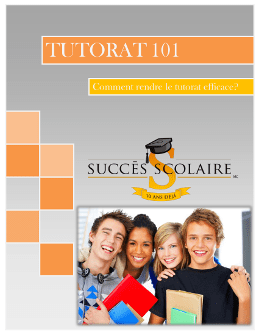 Why choose a math tutor from School Success? Our experienced advisors take the time to match a tutor to your child's personality and the difficulties they are experiencing. Arithmetics, fractions, algebra, geometry, probabilities, statistics... let's just say, math holds no secrets to the specialized tutors at School Success. Through individual support, the tutor ensures that they are taking a unique approach tailored to your child in order to address concepts seen in class, consolidate what they've learned, prevent them from falling behind or help them catch up, suggest efficient work methods and learning strategies and, if needed, provide further advancement. The tutor writes-up a brief account of each session, as well as a more detailed report after every 10 hours of tutoring. This allows you to follow the evolution of your child's work. The tutor also collaborates with teachers in order to ensure a more complete support system. Call us, we will look into what you need. We will match you to one of our tutors who could tutor online, in one of our centers, or at your home. To help a student who has fallen behind in one or many subjects. To prepare you child as much as possible for their high school entrance exam in order to get the best result. To give your child an extra hand in order to improve their grades or simply to satisfy a desire to learn. To offer the support needed for your child to complete their homework and lessons. Our advisors are here to help!